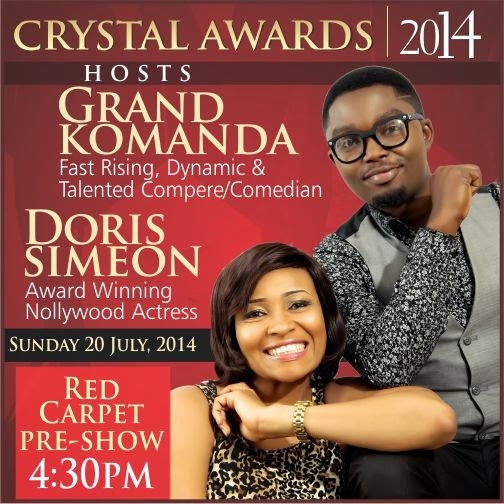 Grand Komanda and Doris Simeon have been announced as the hosts of this year Crystal Awards. With this year’s award night tagged ‘Take Over‘, fast rising comedian/compere Grand Komanda, and award winning Nollywood actress Doris Simeon will co-host to make it a wonderful evening. Live performances will be coming from top gospel acts including; Sammie Okposo, Frank Edwards, Obiwon, Tim Godfrey & Xtreme Crew, Eben, Nene Soul Diva, Tehila Crew, Henrisoul, Ada, Gaise, Joe Praize, and many more. Attendance is by invitation. Kindly call +2348055599677 or +2348022232346 for seat reservations. Meanwhile, voting is still on and will end on Tuesday 15th July 2014.